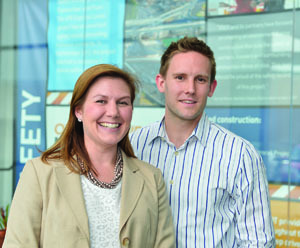 Mike McGurk and Jamie Breme know first-hand how quickly Fairfax County has grown over the years. They both grew up here and are graduates of Fairfax County Public Schools. Now, as employees of two companies involved in the I-495 Express Lanes project, they get personal satisfaction in knowing their employers are giving back to their community through the I-495 Express Lanes Grant Program. Since 2009, the grant program has provided generous contributions to nearly two dozen park programs and projects through the Fairfax County Park Foundation. They include the Summer Entertainment Series, trail and stream restoration initiatives, environmental education programs, family fitness events and recreational activities and camps.